A while back I developed a short lived mindset that I couldn’t be bothered reading books or novels anymore. My daily blog feeds, social media streams, and writing workshop materials were enough to manage. I felt too distracted, too impatient and like too much of a procrastinator to make the time or mental space to enjoy any piece of writing longer than five pages. 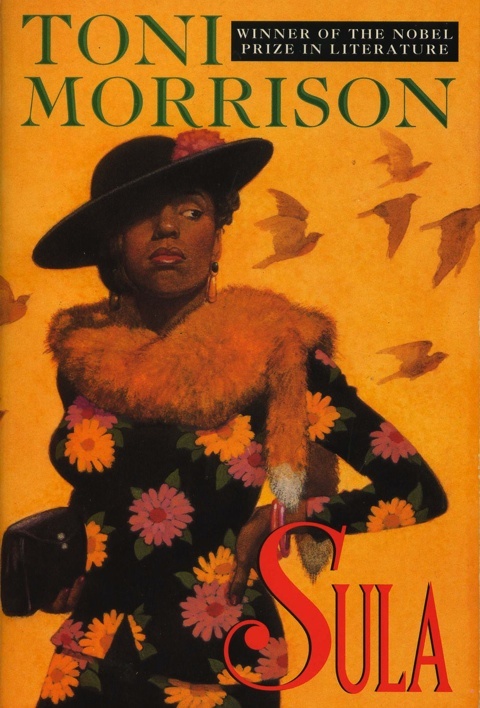 And then I read Toni Morrison’s novel Sula over the course of two days. It might have taken me longer to read, but I was on a deadline – I needed to be prepared to discuss the work in my Monday night workshop, and procrastination left me only two days to get through it. By the fourteenth page, I moved past the fact that I was force feeding myself the words and the story. I was in the Bottom – a town that “stood in the hills above the valley town of Medallion.” (3) I became entangled in an intricate web of insanity, sexual promiscuity, poverty, death, and thick grief for the living. In the last line of the book, Toni Morrison moves me to grief. “It was a fine cry—loud and long—but it had no bottom and it had no top, just circles and circle of sorrow.” And in the line before that, Nel cried out for her dead best friend, “O Lord, Sula….girl, girl, girlgirlgirl…” (174). Throughout the book, much of the characters’ pain and confusion was acted out rather than articulated. Eva, a matriarch mother, sets her son Plum on fire and kills him because he is addicted to heroine. With kerosene and fire, she put him out of his misery. Eva’s daughter Hannah sets an outdoor barn fire on a hot summer day and throws herself in it, dancing in the painful hot flames until her internal pain was no more. Maybe deep love – and pain, both require some sort of freeing insanity. Nel’s soft howling represents a realization of grief and a verbal “spilling out” of pain – as do the fires and charred remains. Despite the hurt I felt for Nel, and Sula, and Eva, and Hannah, and to a very minor degree – Plum, I enjoyed reading again. Sula calls into question the ideas surrounding the depth and span of love. And the many ways we grieve. Thank you Abby315 for inspiring this post. ‹ Long Distance Love – Are You Built For it? I definitely know the feeling of dragging yourself back into reading, especially during school. But I’m glad you made it through Sula because jeez, what a ride, right?? And I’m happy someone else thought the ending lines were incredibly powerful, especially the typography of “girl, girl, girlgirlgirl,” it was positively haunting. I didn’t want to put it in my review for fear of spoilers but yeah, it hit me like a punch in the gut. There’s definitely a fine line between love and intense grief in the book. I’m sure it’d be worth exploring someday. It’s certainly worth exploring. I think I’m going to give Sula another read. This is actually the first time I’m posting a hint of a book review on my blog. I’m glad you got back into reading, particularly for such a good book! I often feel reading getting squeezed out by everything else that’s going on, but it’s so good when you make time. It definitely is. Someone gifted me Toni Morrison’s latest book yesterday.